Both my son and daughter attend T10 Holiday Camps every holiday which has helpe dtheir confidence and make new friends. Holiday camps are great news for me as I work full time and therefore take full advantage of this great offer each school holiday! Thank you for your flexibility and continued care for my children. The best thing for me about T10 camps is the flexibility of the times my children can attend. Some days I have to work late and the extended days at c. It’s a massive thumb’s up from me! My children are never bored at camp. They always have lots to tell me about their day at pick up time! I love the way their little faces light up on arrival. They particularly enjoy their gymnastics. A job well done, thank you! Thank you! Because of your camps I can now feel comfortable in the knowledge that my daughter is in a safe and friendly environment every school holiday. She cannot wait to come every day and cries when it’s home time because she never wants to leave her new friends! I struggled to find affordable and reliable childcare for my children aged 5, 8 & 10 years during the school holidays until I was recommended to T10 Holiday Camps. I benefit so much from the fantastic service and am so glad I found T10! Please use our circular tabs above for further information about T10 camps and the information below. If you have any further questions please get in touch. 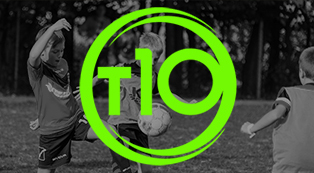 BUY 1 GET 1 FREE SPACES - Please book one child on through our online bookng system , once complete please contact T10 Coaching to book your FREE buddy's space by emailing their details to hello@t10.co.uk with your bookign ID. Every football crazy child’s dream, to play football ALL DAY! Your aspiring Messi will take part in an wide mixture of football related actitvites. Whether it is keepy uppy competitons or REDS vs BLUES they will be tired at the end of the day but begging to return the next! For children with a sense of adventure, ready to explore different types of sports! A camp which mixes each day up to offer 2-3 activities. This camp will open your childs mind and could spark an interest in a long term hobbie , creating a future British Sports Star! Specialist Football Camp for players who want to receive Elite coaching and push their boundaries of play whilst competing against like minded players of their age. Players channel their focus in an intense learning environment aiding development for the field. Days available are shown by a small circle or square. To select the days you wish to book just click the day. It will turn green to show you have selected it. To unselect just click again.